Szul.com brings you Black Friday 3. Save as much as 90% when you purchase jewelry and accessories. Plus, it’s free shipping too! Find earrings, rings, pendant, bracelet, necklace, cuff links, and more in black diamond, white diamond, and sterling silver. 271 items are currently on sale and you can easily filter them out based on prices. Check the site’s bestsellers too. Szul by the way is an industry expert when it comes to diamond jewelry and accessories as well as other products you can wear or send to someone special. Don’t miss it! Buy your jewelry now at Szul! Sale offers never stop. After the extended Black Friday and Cyber Monday deals from the last week of November, here comes the holiday cheer of December. Abe’s of Maine joins the celebration with its holiday sale. You can now shop for various products as early as now. Whether you’re looking for gift items for someone else or for yourself, Abe’s of Maine can help you with that. Browse through items on sale including DLSRs, Point & Shoot products, camera accessories, camcorders, televisions, home entertainment, portable electronics, tablets, laptops, & peripherals, appliances, and fitness. See the whole list here. Take advantage of this holiday sale from Abe’s of Maine now! OrangeOnions.com features a super extended Black Friday and Cyber Monday deal. 32 more items are still offered at very affordable prices with discounts of up to 85%. Just use the coupon code ORNGWED to avail of the discounted price. These are offered until 12/12/2011 but cannot be used with any other codes. Items offered include speakers, luggage, cookware set, cutlery set, multi cooker, oven toaster, coffee brewer, bags, toy box, puzzles, games, toys, Barbie dolls, poker set, playing card leather case, coin bank, flower vase, art kit, display items, Christmas ornaments, party set, sleeping bags, and scooters or bikes. Check this page for the list of items. Don’t wait until 12/12, these may not be there anymore. Buy now! If you missed shopping for Black Friday and Cyber Monday, Dell Small Business offers an extended sale for you. Shop until midnight of December 2 to avail of the most amazing discounts for laptop, desktop, LCD monitor, printers, and computer accessories. As of this writing, items featured are the Dell Vostro laptop & mini tower, Dell Latitude laptop & monitor as well as the Dell Ultra Sharp monitor. Scroll down and you’ll find best selling items not only from Dell but from other manufacturers too. All these are perfect for every business. Another advantage is that you can customize each order to suit exactly what you need. Most item even comes with free accessories. So whether you’re shopping for your home or your business, you should take advantage of Dell’s extended Black Friday and Cyber Monday Deals while it lasts! Abe’s of Maine Black Friday Deals? You think it’s over. Well, it is. Almost. But not for Abe’s of Maine. 29 items are still offered for a much extended Black Friday offering. Find digital cameras, camcorders, HDTVs, printers, headphones, GPS navigation systems, dishwasher, refrigerator, vacuum, coffee dispenser, kitchen appliance, and workout equipment. The top brands are up for grabs including Canon, Nikon, Panasonic, Samsung, Lenovo, Konica, Garmin, Monster, Bosch, Dyson, Espressione, Cuisinart, Schwinn, Kettler, and Evo. Drop by this page to see everything that’s offered for you. So don’t wait until it’s completely over. Shop from Abe’s of Maine right now! and receive as much 80% or even 85% from luggage bags. The offer is available from 11/25 up to 11/28 or while supplies last. 1. Samsonite nested 5-piece luggage set. For purchases over $99, you are also eligible for free shipping. Oh wait, we did say 8 items right? Well, we also said “while supplies last.” One of the 8 items is no longer available. It’s sold out! So don’t wait till everything gets sold out on you, buy from Luggage Online right now! The Shade Store offers an extended Black Friday offering. 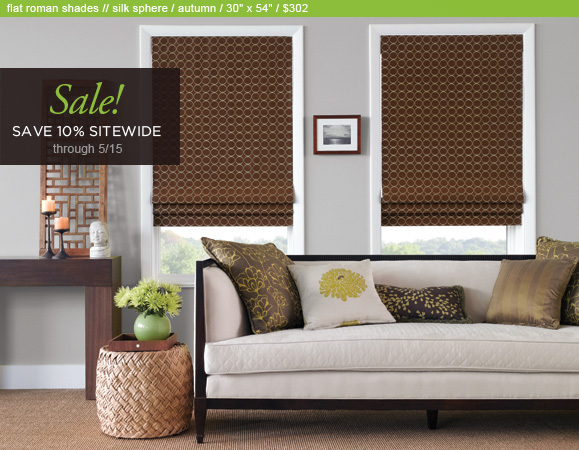 You save 10% offfrom Roman shades and drapery. With these, you can create a multi-layered finish for your windows. Make them look refreshing or festive, just in time for the Christmas holidays. You can also use the Roman shades and draperies to add drama and soften up the look of your bedroom or living room. In the hallways, library, media room, and elsewhere within the house, they add elegance and accentuate the style you would like to portray in your home. · All orders can be expected within 10 days. It’s free shipping too! only from the Shade Store!